This project has four main objectives and they are: first, to characterize existing leafy spurge and biological control agent populations at First Street Pasture and their impacts; second, to demonstrate how grazing affects the size and efficacy of leafy spurge flea beetle populations; third, to demonstrate realistic timelines and expected results for leafy spurge biocontrol; and, finally, to demonstrate how to assess and monitor biological control agent populations, their efficacy, and their migration to aid in invasive weed treatment decisions. The. first of three flushes of leaf tier moths occurred at First Street Pasture, tying up the top of the leafy spurge plant so it can’t flower and set seed, June 2015; photo by Mae Elsinger. 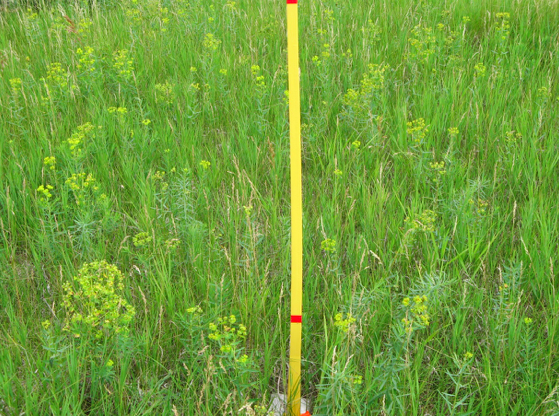 Leafy spurge distribution over much of First Street Pasture is thin enough to prevent rejection of use by cattle, June 2015; photo by Mae Elsinger. Mature leafy spurge plants as they appear in early June; photo by Mae Elsinger. Almost favourable density of leafy spurge in the H Exclosure at First Street Pasture – 36 stems/m2 on July 6, 2016. The ideal peak biocontrol target is 5 stems/m2; photo by Mae Elsinger. Moderate density of leafy spurge in the D Exclosure at First Street Pasture – 64 stems/m2 on July 6, 2016. The ideal peak biocontrol target is 5 stems/m2; photo by Mae Elsinger. Most of the First Street Pasture area is affected by leafy spurge (Euphorbia esula L.), but it is thickest at the southern one-third of the pasture. However, only a portion of the pasture can be said to be truly dominated by this weed. The true impact, throughout the First Street Pasture as a whole, has not yet been quantified. Lots of properties like this exist in Manitoba (e.g. Crown lands and old pastures), and for various reasons their landowners are reluctant to put full effort into fighting weeds (i.e. restricted development on Crown lands and uneconomical on others). There is evidence that leafy spurge biocontrol agents were deposited at First Street Pasture in the 1990s, for example, leaf tiers (Lobesia euphorbiana Freyer 1842), and brown and black flea beetles (Aphthona Chevrolat in Dejean, 1836), but there was insufficient follow-up to spread them around and monitor results. The presence and abundance of various leafy spurge biological control agents at First Street Pasture should be quantified as a follow-up. Ideally, with a better understanding of biocontrol populations and their emergence dates at First Street Pasture, this site could become a leafy spurge biocontrol collection site for producers and land managers if we find population numbers to be sufficient. Leafy spurge beetles are most effective in their larval stage, but adult beetles do have some impact1. Adults emerge from early to mid-summer, mate, and lay eggs afterward. When hatched, larvae go down into the root system of the spurge and feed on the roots of the spurge throughout the fall, winter, and spring. Their observable effects on spurge are what you would expect for a sprouting plant being attacked from the roots − an initial flush of stems, but they have reduced vigor, higher number of non-flowering stems, and are shorter. During the first year, they can produce what is known as a “halo effect” where a circle is formed around the release site where leafy spurge stems are reduced or absent. The halo grows larger if the population is sustained year after year. If the beetle population is sustained and the effect continues to progress over the years, stem counts go down toward zero, but the spurge is unlikely to be eradicated. Different species of leafy spurge beetle species have different population habits, and perform at their best in different environmental conditions. Recently, Agriculture and Agri-Food Canada has been working to understand and enhance the potential for various black leafy spurge flea beetle species to establish viable populations on the Prairies for the control of leafy spurge. Leafy spurge flea beetles have been successful at minimizing leafy spurge cover in many areas of the northern Great Plains, and the same results are desired here. We expect that success will come with moving beetles around within a site, avoiding deleterious site management practices (especially herbicide use), and matching the different leafy spurge beetle species better with their ideal habitats and land management practices (i.e. grazing). Leafy spurge beetles are responsive to environmental conditions and accelerated growth of leafy spurge. However, the best habitat (litter and plant cover, soil texture, aspect, drainage) and profile of environmental conditions (temperature, growing degree days, precipitation, soil moisture, etc.) to predict emergence dates of adults is largely unknown. Thus, as part of the biological control project, we are interested in monitoring and comparing the performance of boosted leafy spurge beetle populations in grazed versus ungrazed pasture at First Street.